When it comes to presenting the results of your work to customers or to your team, choosing the right data and graphic elements can be tough. Reports need to somehow balance the progress that your audience expects, with your top SEO goals. AWR helps you with a set of 5 predefined reports, designed for presenting different aspects of search optimization efforts. Not sure they are exactly what you need? Not a problem =). The Editor allows you to personalize the reports with powerful customization options and turn them into your best assets. Metrics - for example, you can replace Visibility Percent with Average Rank as a top KPI for your report. Data source - you can replace a Google Analytics KPI with a Search Console or Ranking KPI. Widget type - you can replace a report table with a chart, or a Pie chart with a Bar chart and more. Time interval - you can replace the default value of 1 month with another predefined interval (2 days, 1 week or 3 weeks), or you can set a custom interval. Inputs refining - most widgets allow the selection of particular search engines, keyword groups or keywords. For example, you could refine the keyword position distribution for a specific keyword group. Filtering and sorting - with table report widgets, like Keyword Ranking, you have the possibility to apply ranking filters and sorting preferences. 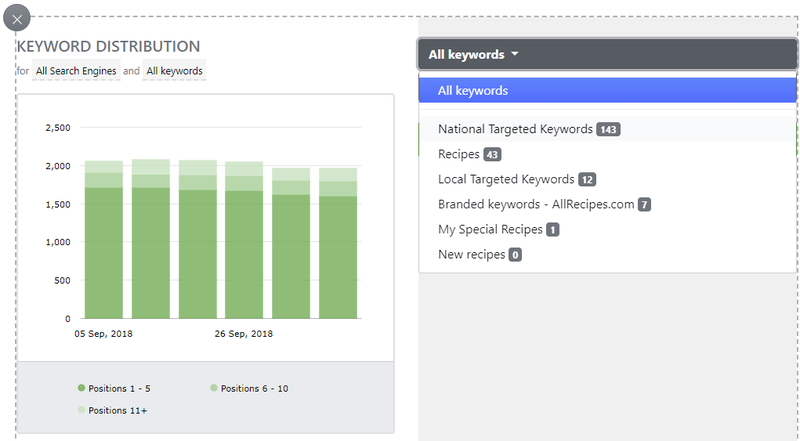 For example, you could include only keywords that rank on the first page of the SERPs, or only keywords that moved up on the latest rankings update, and sort the data ascending by the keyword search volume. Logo - you can easily brand your reports in AWR by adding your company logo in the Editor. 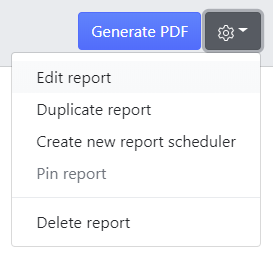 Report title, headings and descriptions - you can change all text entries in the live reports or remove them completely. In addition, you have the possibility to add new text blocks where needed. Divider and page break - these elements allow you to separate various sections on the same page, or to move a specific section at the beginning of a new page. When editing a report in an AWR project, changes will be saved on that report globally across all projects, except for changes that concern inputs refining. For example, if you change the data source on a KPI widget from Search Console to Analytics, this will be reflected in the report regardless of the project from which you are accessing it. However, if you refine the data in a widget by a specific keyword group, this will be applied only for the project where the change was saved.